On the Atlantic slope of Central America from Mexico south to Honduras you can find one of my favorite Central American cichlids – Thorichthys aureum. Commonly called the “Blue aureum” or “Gold aureum”, this fish shares many physical characteristics with it’s more commonly available relative, Thorichthys meeki, the Firemouth. The two common names for this fish point to the two color variations found – blue and gold. The “Blue aureum” matures into an incredibly colored fish. Intense turquoise borders bronze scales, blue streaks adorn the fins, and the dorsal fin is edged in bright red. The “Gold aureum”, while not as flashy in my opinion, is understated in its elegance with a golden coloring bordering steel blue scales. It also sports the blue streaks in the fins, as well as the red border on the dorsal fin. Both color forms exhibit the trademark of the Thorichthys genus, a black spot on the operculum, and grow extremely long filaments from the tips of their caudal fins. With an adult size of 6″-7″, these fish make ideal specimens for a Central American tank. 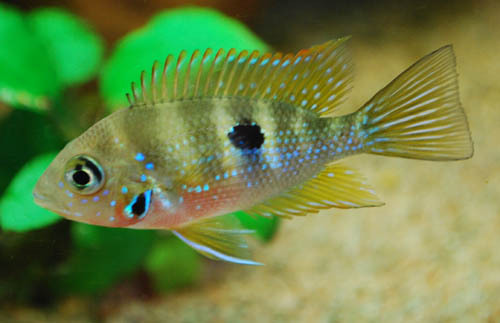 The fish grow large enough to be “showy”, stay small enough to be housed in medium-sized aquariums, and exhibit less aggressive behaviors in captivity as compared to most members of the Nandopsis, Herichthys, Theraps, and Amphilophus genera. My aureum were purchased as a group of four 1″ juveniles in November of 2001. They were housed in a 75 gallon tank with seven juvenile Archocentrus centrarchus of a similar size. The tank was kept at 78F, and was decorated with large chunk rock, slate, and a few large plastic plants. Substrate was gray calcite, which was useful in keeping my neutral, soft tap water buffered and my pH at 7.8. Cichlid salts were also added to bring my water to 7 degrees GH. The tank was filtered with two HOB power filters and a fluidized bed. 60% water changes were performed weekly. These fish are not hard to feed. Quality flakes, pellets, and frozen food such as mysis, bloodworms, and glassworms were all readily eaten, though the fish did show a preference for food that sank. As they are substrate-sifters in the wild, this was not surprising. Be careful not to overfeed, as they are prone to bloating. The fish grew quickly on this diet and I was soon able to tell males from females. Females will have a prominent dark spot in their dorsal fin, while males will not. As luck would have it, I had two males and two females. After observing the fish for a few months, it became easier to see how the fish were doing by watching their color patterns. When stressed, aureum will show a black horizontal line from operculum to the base of the caudal fin. When content, the fish exhibit wide vertical dark barring instead. A black blotch may also be present halfway back on the body just below the lateral line. With the onset of breeding, all colors intensify. After approximately ten months, my largest male was 5″ and my largest female was 4″. The female began to follow the male around the tank, and the two slightly smaller aureum were banished to the other half of the aquarium. The large male would chase the smaller male aureum, but the larger female would chase both the smaller male and the smaller female. Flaring their gills in typical Thorichthys fashion, there was far more bluffing going on than actual fighting. The centrarchus were never harassed. Assuming they had begun to pair up, I fed them earthworms for 5 days. The female fattened up nicely, and the pair began to take turns cleaning a large piece of horizontal slate. On the sixth day I could just see the ovipositor of the female begin to extend. I then proceeded to do an 80% water change on the tank. Though I eagerly checked the tank each day I came home from work, nothing happened and the females ovipositor had retracted. Disappointed, the following week I fed earthworms heavily again and performed another 80% water change during mid-day. This time I dropped the temperature of the replacement water to 76F and ratcheted up the heater setting to 81F. I was trying to simulate the effects of a large rainfall, and was hoping to stimulate the spawning by adding a little temperature to the water. Again I saw the females ovipositor, but still nothing happened. Frustration was setting in. Then I remembered that that some species of cichlids are picky about what time of the day they’ll breed. Some have a preference for dawn or dusk. I followed my breeding preparations just as before, but this time I performed the water change first thing in the morning while the tank lights were off. I left the tank lights off and the room lights on with the hopes of simulating dawn as best I could. Four hours later I returned to find both fishes looking ashy gray with charcoal stripes. Almost all of their colors were gone. Looking closer, I saw a plaque of about 200 eggs on the piece of slate! My persistence had been rewarded. The eggs were guarded by both parents, hatched on day three, and the fry became free-swimming five days later. The parents moved them to pits that they had dug in the substrate, and did their best at keeping the other aquarium inhabitants at bay. I left the first batch in the main tank with the parents with the hope of cementing the pair bond and added powdered fry food three times a day. The fry grew well on the powdered food but within two weeks the parents had lost control of their small school and their numbers dwindled as the other tankmates slowly ate them all. The fish spawned again five weeks later. This time I siphoned about 150 fry out to their own 30 gallon tank which was filtered by an air-driven sponge and full of Java moss. The fry were fed with newly-hatched baby brine shrimp and powdered fry food. Their numbers dropped and stabilized at about 100 fish. They grew quickly on this diet and were swapped to strictly prepared foods by 4 weeks of age. Since then, a few have grown to over 3″ in length and it is only a matter of time before they begin to pair off. The fish regularly spawned for me at 5 week intervals, and I stopped siphoning when I had no more room for the fry. Eventually I traded the two pairs away and concentrated on raising the fry that I did have. I hope this article has convinced you to consider Thorichthys aureum for your next Central American aquarium. A 29 gallon tank could house a pair if enough cover is provided for the female and water changes are done regularly. For small groups, a 40 breeder or 55 gallon tank would work much better. With a knockout combination of beautiful colors, manageable size, even temperament, and advanced behavior, they truly are one of my favorite fish.